This recipe for Seared Salmon Fillets with Pistachio Basil Butter is elegant enough for company, and yet easy enough for a busy weeknight. I’ve been wracking my brain trying to remember where I first saw Stuart on TV. I remember it was some cooking reality show (one of my weaknesses) involving caterers (I think), but the rest escapes me. If anyone out there remembers, please put me out of my misery and let me know in the comment section. I will be forever grateful. 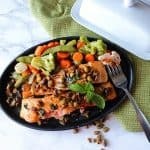 I recommend using a cast iron skillet for searing the salmon fillets, but if you don’t have one, please don’t let is detour you from making this recipe. That said, you will need a skillet that is oven-safe because once you sear the salmon on the stove top, the remainder of the cooking is done in the oven (as per the cookbook instructions). However, you can always add the salmon to a different oven-proof dish, and that will work too. I’ve got your back! Season the salmon with salt and pepper. 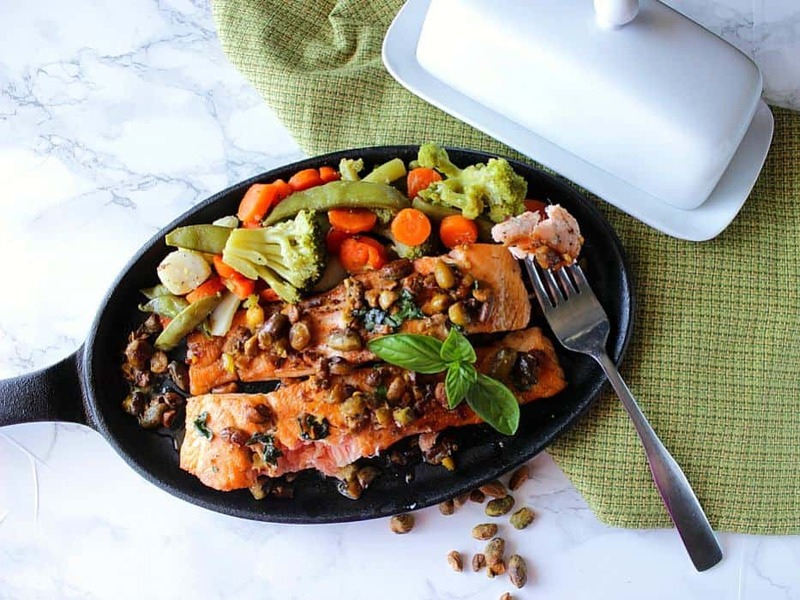 Sear the salmon on both sides in the canola in a large, hot skillet. Remove the salmon to a plate. Melt the butter. Add the pistachios, red pepper flakes, and lime juice. Stir to combine all the ingredients. Return the fillets back into the skillet and put the skilled in a preheated 375 degree oven for 5 minutes. Remove the skillet from the oven and spoon the pistachio butter over the fillets. Garnish with chopped, fresh basil leaves and serve. Rough chop the pistachios and set aside. Preheat a large skillet on medium/high heat. Dry the salmon fillets with paper towels and season them with salt and pepper to taste. Add the canola oil to the skillet and immediately add the fish fillets. Sear the salmon on both sides (approximately 3 minutes per side). 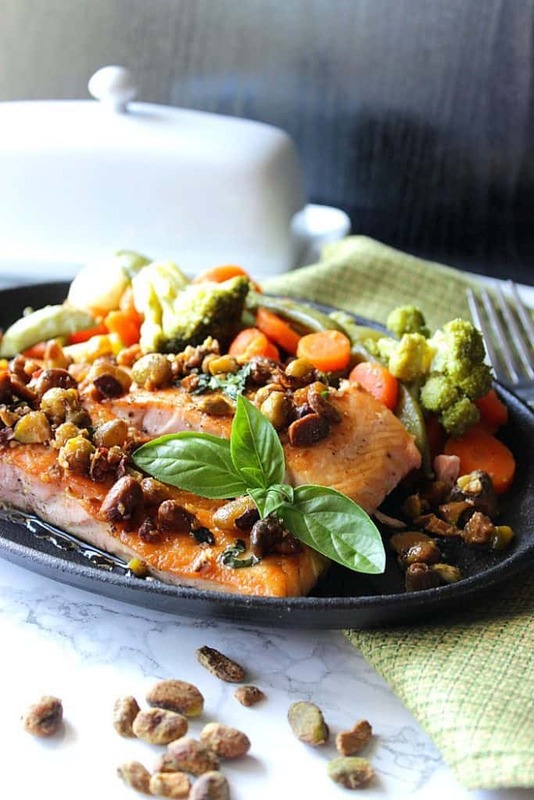 Remove the salmon to a plate and reduce the heat to the skillet to low. Add the butter to the skillet along with the chopped pistachios, red pepper flakes and lime juice. Stir the skillet ingredients to combine. 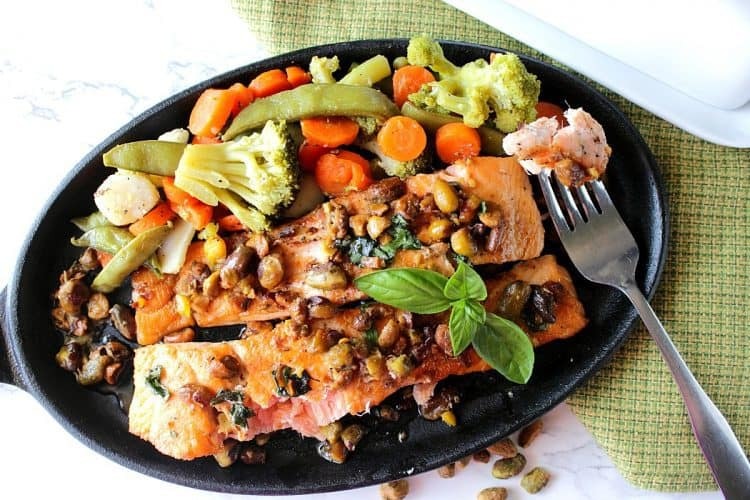 Return the salmon back to the skillet and place the skillet in the oven for approximately 5 minutes. Remove the skillet from the oven and spoon the butter and pistachio sauce over the fish. 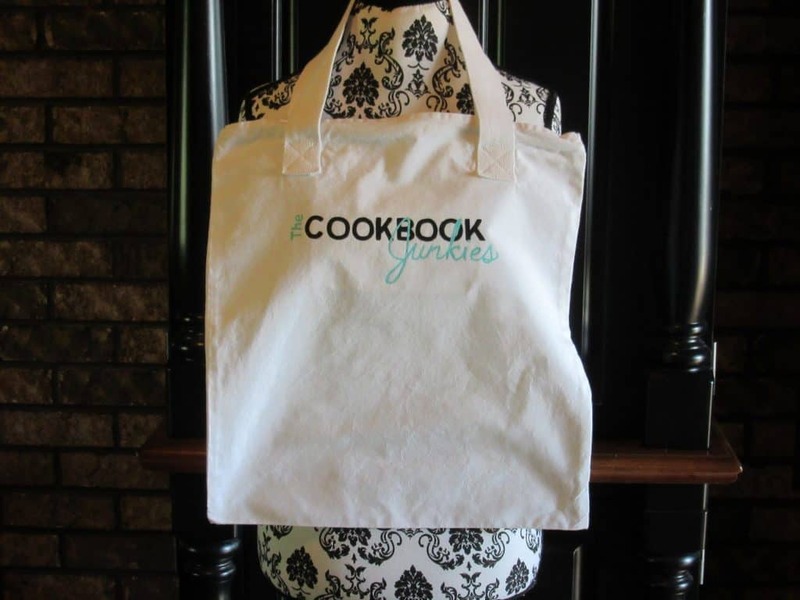 Since this post is coming from an actual cookbook, I think it’s only fitting that I coordinate this recipe with these Cookbook Junkies hand painted apron and book bags that I’m proudly partnering with my friend Jenny on. 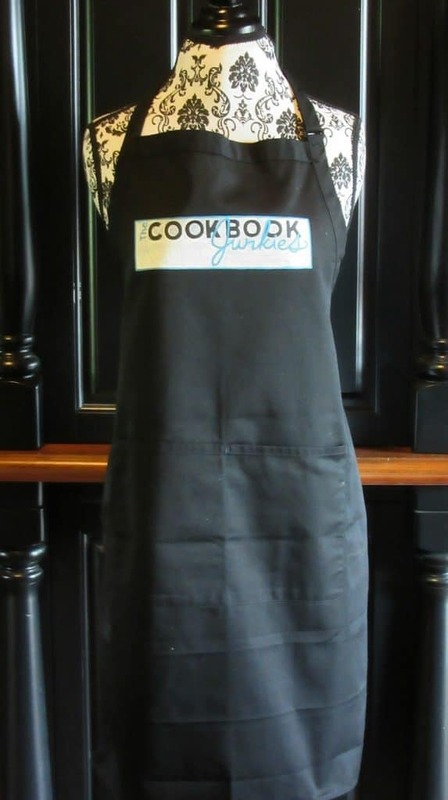 Jenny is the owner/administrator of the wildly popular Cookbook Junkies page on FB, and she is also the author of The Cookbook Junkies website where she reviews and cooks from some of the most popular cookbooks in the marketplace, in addition to shining a bright spotlight on cookbooks that may not be as well known, but with Jenny’s recommendation and clout in the cookbook world, will be. That dish looks great! Thank you! What a wonderful dish!! AND that butter…Wow!! Everything’s better with butter, and pistachio butter is even better! Thanks, Katerina! What a great salmon dish! YUM! I agree, Brandy. 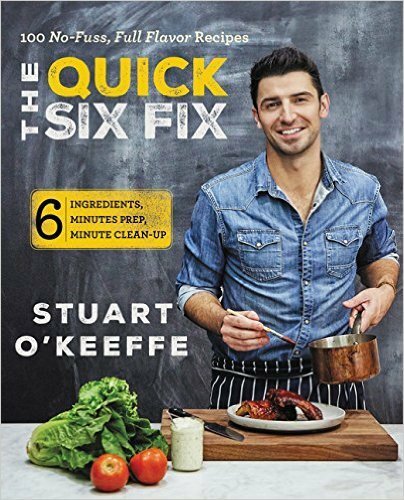 Chef Stuart O’Keeffe really knows his stuff. What a lovely looking dish! I have a weakness for pistachios, too, so I’m sure I’d devour this! Great that you’ve added step-by-step photos — always helpful! Thanks so much, Patricia! I love adding the step-by-step photos because I think they may be really helpful for those who need the visual. I tend to be a visual learner so that’s why I do it! Wow! I’m all over that pistachio basil butter! Looks amazing! 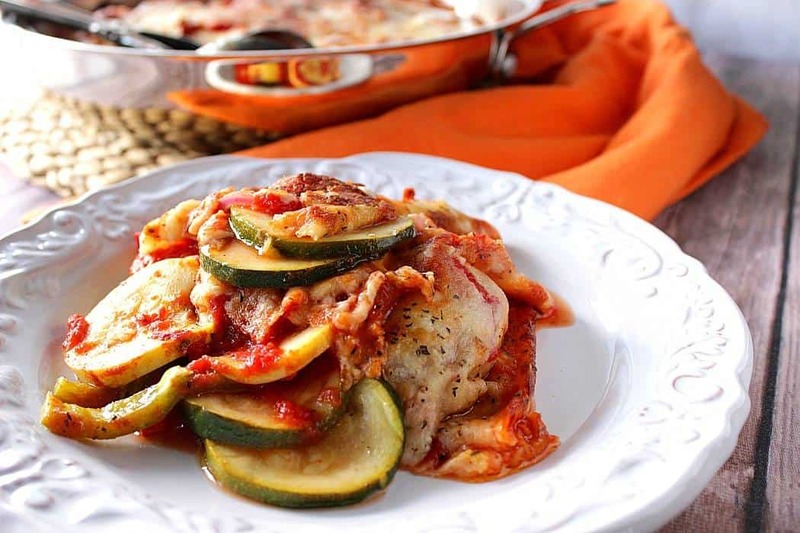 This sounds so tasty, and I love that it’s fairly easy! Thanks, Dee. It’s VERY easy. 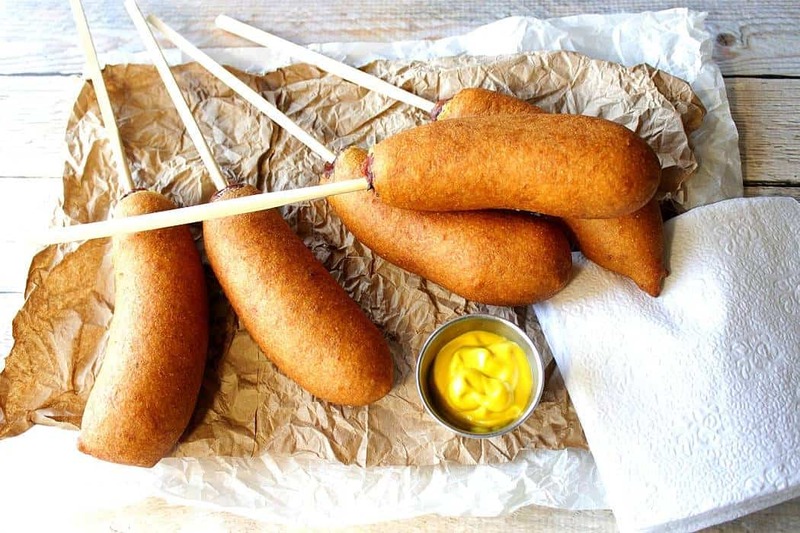 Anyone could make this recipe and be successful! What a gorgeous salmon dish! We eat pistachios by the handful here and I can imagine they add wonderful flavor to the fish. I do too, Dara. They are one of my many favorite nuts. 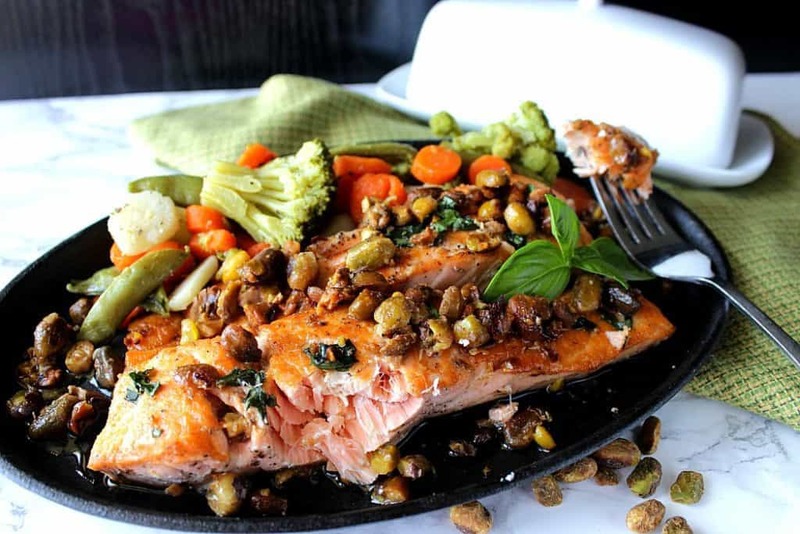 I’ve never met a salmon I didn’t like…and the pistachios on this sound amazing!